I read these books a few years ago, but they still speak truth–perhaps even more so in light of the earthquake in Haiti and our current economic climate. … we are learning how to suffer well. Not to avoid it but to feel the full force of it. It is important that churches acknowledge suffering and engage it—never, ever presenting the picture that if you follow Jesus, your problems will go away. Following Jesus may bring on problems you never imagined. Suffering is a place where clichés don’t work and words often fail. … And it is in our suffering together that we find out we are not alone. We find out who really loves us. We find out that with these people around us, we can make it through anything. And that gives us something to celebrate. Yesterday, to commemorate Martin Luther King, Jr. Day (today), President Obama spoke at Vermont Avenue Baptist Church, where MLK himself had spoken some fifty years before. We gather here, on a Sabbath, during a time of profound difficulty for our nation and for our world. In such a time, it soothes the soul to seek out the Divine in a spirit of prayer; to seek solace among a community of believers. But we are not here just to ask the Lord for His blessing. We aren’t here just to interpret His Scripture. We’re also here to call on the memory of one of His noble servants, the Reverend Dr. Martin Luther King, Jr. So let us hold fast to that faith, as Joshua held fast to the faith of his fathers, and together, we shall overcome the challenges of a new age. Together, we shall seize the promise of this moment. Together, we shall make a way through winter, and we’re going to welcome the spring. Through God all things are possible. 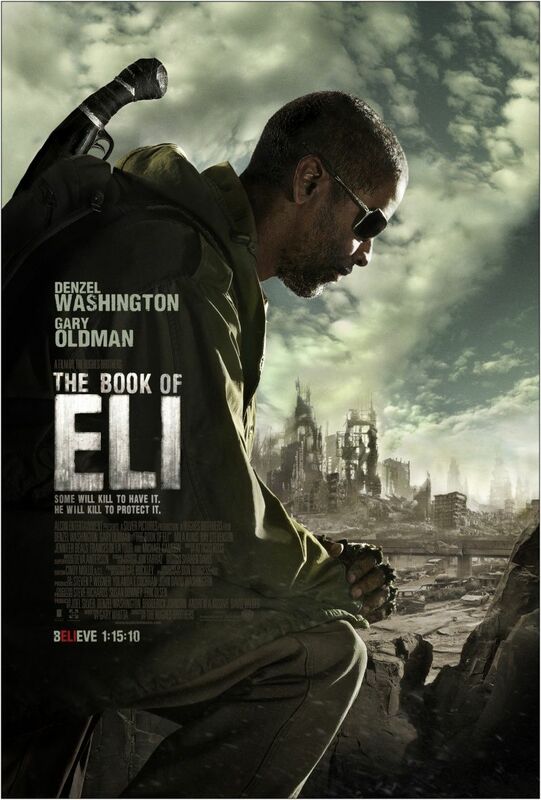 Yesterday, I went and watched the new Denzel Washington movie, The Book of Eli. Denzel–who remains one of my favorite actors–stars as a mysterious wanderer, Eli, who journeys across post-apocalyptic America bearing a sacred book. I’m not gonna say much more than that about the plot–I’d rather you go see it yourself. I enjoyed the sterling performances from Denzel, as well as from the supporting cast of Gary Oldman, Mila Kunis, and Jennifer Beals; and I thought the story was nuanced and well-adjusted enough to avoid heavy-handedness or preachiness. And on a related note, the movie reminded me of the importance of Scripture: of reading, speaking and hearing the Word of God. Hearing Denzel Washington reciting Psalm 23 was pretty sweet.